Morgan Nelson takes a swing. The senior had five hits, including a homer, to help NU to a 4-1 record this weekend. 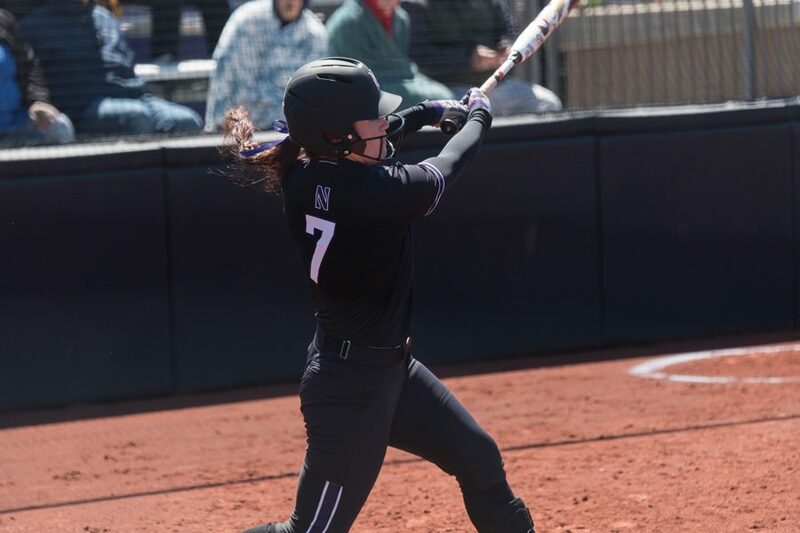 The nickname “Cardiac Cats” was originally given to the Northwestern football team, but this season, the moniker has applied to softball as well. With Danielle Williams in the circle, though, the Wildcats (11-3) have to like their chances. The freshman pitcher led NU to a 4-1 finish at the Mary Nutter Collegiate Classic in Cathedral City, California. Williams threw a one-hit shutout on Friday as the Cats edged Brigham Young (6-7) 1-0. Later that day, she entered a tie game against Duke (6-9) in the seventh, throwing two scoreless innings before hitting a walk-off single in the eighth as NU won 6-5. Williams had another complete-game win on Saturday, giving up just four hits and one run to Long Beach State (6-8) to lead the Cats to a 2-1 victory. Her magic finally ran out on Sunday, when she held No. 5 Washington (14-1) scoreless through four innings before the Huskies broke through in the fifth to hand Williams her first loss of the season and claim a 3-1 win. In the tournament opener against the Cougars, senior left fielder Morgan Nelson hit an RBI single in the first inning, and Williams held the one-run lead throughout the game. The nightcap on Friday was a back-and-forth affair. NU took a 3-1 lead in the first on a single from junior pitcher Morgan Newport and a two-run double by freshman shortstop Maeve Nelson. The Blue Devils tied it in the third, but Newport put the Cats back in front in the fifth with a two-run single. Duke came back with two runs in the sixth to tie it again before Williams entered in relief and won it with both her arm and bat. Saturday’s game against Utah (5-10) was the only blowout of the weekend, as NU won 10-0 in five innings with the run rule in effect. Sophomore pitcher Kenna Wilkey went the distance and gave up just two hits, and Maeve Nelson and Rudd drove in three runs apiece. The Cats led from the outset once again in their second game Saturday against the 49ers. Morgan Nelson got them started with a home run in the first inning, and Williams added an RBI single in the second before taking care of the rest in the circle. On Sunday, Williams had NU on the verge of a monumental upset. She allowed just one hit through four innings, and a third-inning single by sophomore second baseman Rachel Lewis gave the Cats the lead. But it was not meant to be. Washington got to Williams for three runs in the fifth, and NU’s offense was shut down after that third inning.